I already knew but it was nice to hear it from somebody from the west coast. Growing up in Birmingham, there was good dining to be had and there was always an abundance of Greek-owned eateries from hot dog stands to white tablecloth establishments. The place has long been a mecca for classic southern “meat and three” places and the quality and variety of barbecue and barbecue styles in the area is an embarrassment of riches. But when Frank Stitt opened Highlands Bar and Grill (www.highlandsbarandgrill.com) in Five Points South in 1982, the bar for Birmingham dining was significantly raised. A few years later Stitt opened Bottega and Bottega Café (www.bottegarestaurant.com) a few blocks away on Highland Avenue and then Chez Fonfon (www.fonfonbham.com), a more casual bistro, next door to Highlands. Add to that a preponderance of good eats from other chefs, many of whom worked for Stitt before striking out on their own. There are always a new attitude and a new swagger creating a great and unpretentious urban destination for dining at every level and taste. In the Five Points South area near Highlands, I am partial to Ocean (www.oceanbirmingham.com) and Hot and Hot Fish Club (www.hotandhotfishclub.com) but every time I go to Birmingham lately it seems that a “must visit” new dining option has opened somewhere in the city. I am falling way behind on keeping up and checking them out. Highlands, however, is still the flagship. It is pricey and elegant and provides an unmistakable sense of occasion when one enters the door. However, it is never snooty nor pretentious, it features the best locally grown and fresh ingredients, and a meal at Highlands is always an opportunity to relax and breathe. Frank Stitt and his wife, Pardis, create gracious and memorable dining experiences for their guests. The wait staff is knowledgeable, efficient, and playful. I like to eat seafood from the Gulf when I am at Highlands; for my taste, Highlands prepares fish better than anybody. But everything on the menu pleases. 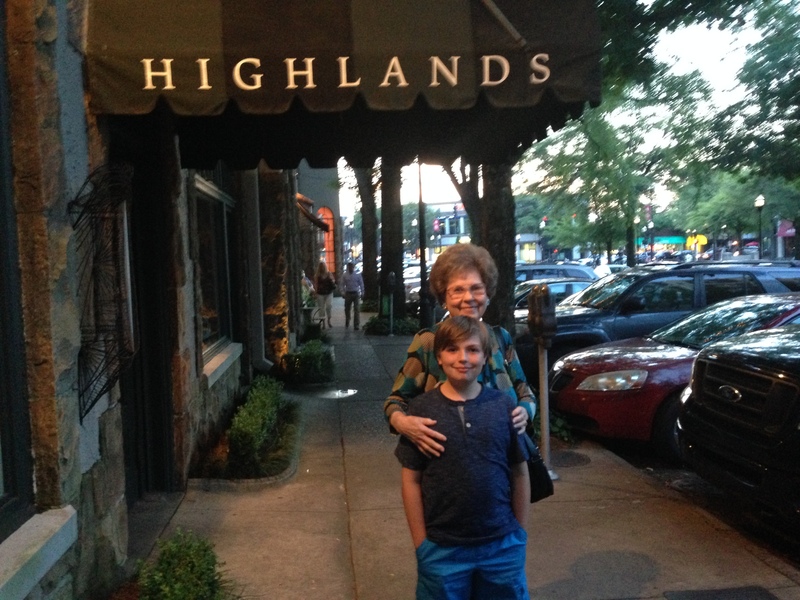 We celebrated my mother’s milestone birthday at Highlands last summer and she declared her steak that night to be “the best steak I’ve ever eaten.” The menu is seasonal and changes often but Highlands baked grits, a signature dish, is always on the menu. Two of my most often thumbed through cookbooks are by Frank Stitt. 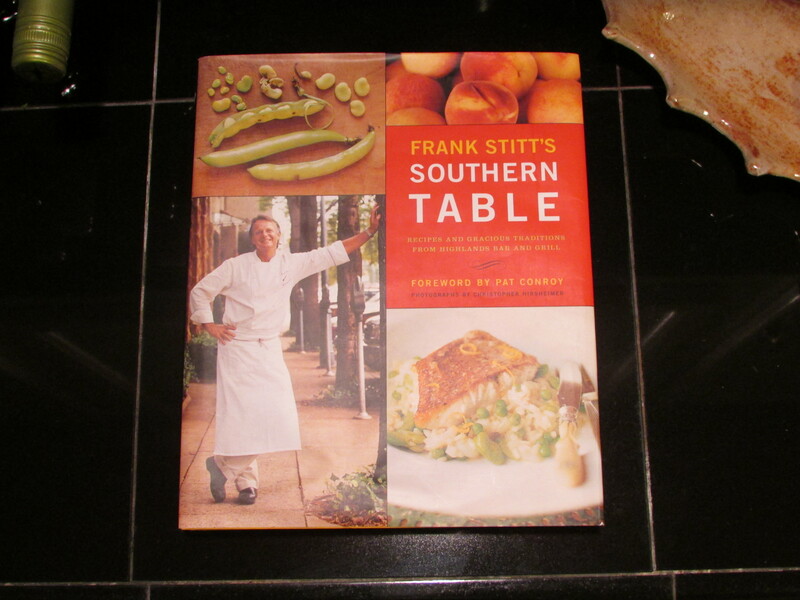 The first, an instant classic, is Frank Stitt’s Southern Table. It was followed by Frank Stitt’s Bottega Favorita. In each, the reader and cook find a delicious assortment of unique takes on food preparation and presentation culled from Stitt’s extensive experience. Stitt is a native of Cullman, Alabama, who attended college at Tufts and Berkeley, apprenticed and cooked in France and the Caribbean, and ultimately opened his restaurants less than an hour from where he was born. Highlands Bar and Grill and Frank Stitt are on my mind this week because the 25th presentation of the James Beard Awards (JBAs) for restaurants and chefs will be held in Chicago on Monday, May 4, 2015. Highlands Bar and Grill is one of the five finalists for Outstanding Restaurant for the seventh year in a row. The other four finalists this year are in New York. I have been paying attention to the JBAs (www.jamesbeard.org) for many years and have paid particularly close attention since Stitt and Highlands have been regular contenders. Stitt was inducted into the JBA Who’s Who of Food and Beverage in 2011 and was named Best Chef – Southeast in 2001. I find that very often the winner for Outstanding Restaurant is a top five finalist several times before it wins so every year I tune in to see if this year is Highlands’ “turn.” I feel good about lucky 7. A confession: I will be watching the James Beard Awards on Monday night. They are streamed every year on livestream.com and I am just enough of a food nerd to watch a couple of hours of restaurant awards. I want to be a witness when Highlands gets its much deserved honor. It will be an honor for the whole city. On the down side, it may make it even harder to get a reservation at Highlands Bar and Grill. This entry was posted in Birmingham dining, Frank Stitt, Highlands Bar and Grill and tagged Alabama, Birmingham, Bottega, Chez Fonfon, dining in Birmingham, food, Frank Stitt, Highlands Bar and Grill, Hot and Hot Fish Club Birmingham, James Beard Awards 2015, Ocean Restaurant Birmingham, the south on April 30, 2015 by gedwardjourney. We must rendezvous there soon! Oh, please please please! I’m up for it anytime. Eddie, so sorry we missed your father’s funeral, I am enjoying reading your blog.